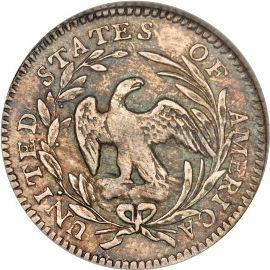 The Draped Bust Half Dime (small eagle version) was distributed during the years of 1796 and 1797. These silver coins were made to replace the earlier Flowing Hair version of this denomination. entering the union. Unfortunately, this was not possible due to space constraints. The reverse of this half dime depicts a small sized eagle on a cloud. The eagle is inside a wreath with the words "UNITED STATES OF AMERICA" encircling it. 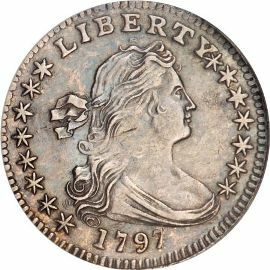 In the effort to keep uniformity these coins are designed to match the larger denominations of dimes, quarters, half dollars and dollars. They also follow the design of half cents and large cents.